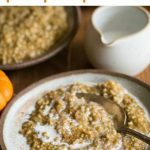 Pressure Cooker Pumpkin Pie Steel Cut Oats recipe for your Instant Pot or Electric Pressure Cooker. 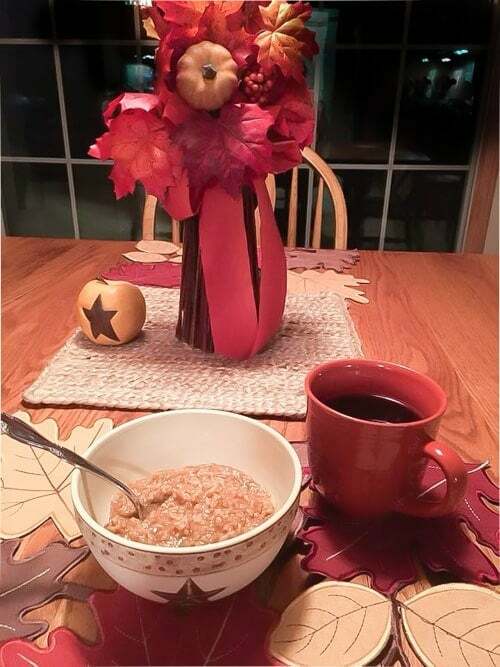 It’s perfect Fall food and an easy healthy gluten free oatmeal breakfast recipe cooked with brown sugar and pumpkin pie spice! You can easily adjust the sugar to taste, my kids like it sweeter than I do. 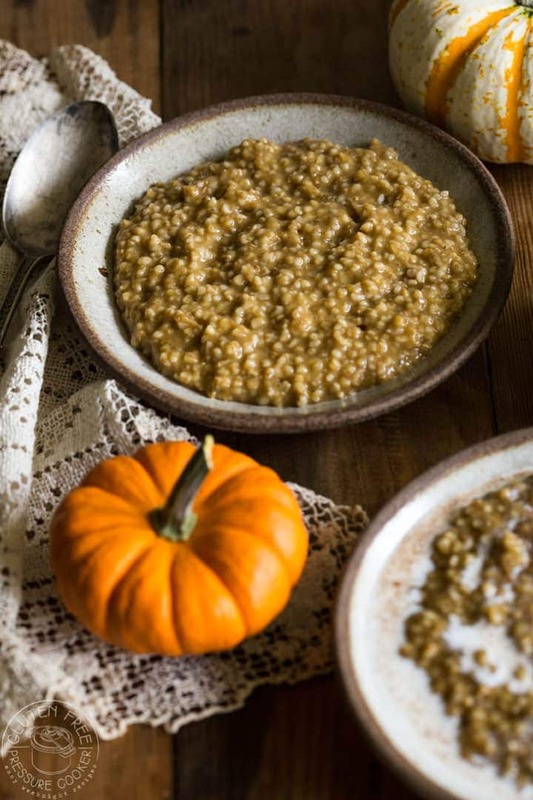 SOME OF YOU LOVE MY PRESSURE COOKER PUMPKIN PIE STEEL CUT OATS RECIPE! 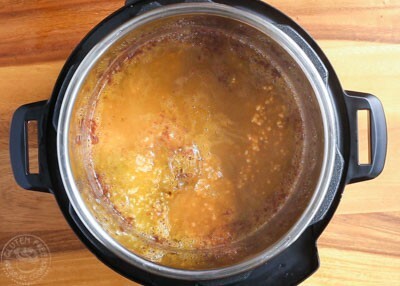 If you make this Pressure Cooker Pumpkin Pie Steel Cut Oats Recipe, snap a quick photo with your phone, and hashtag it #noshtastic if you are on Facebook, Twitter, or Instagram or tag me @noshtastice, or you can email me your snap at sheena at noshtastic.com and I can share the best ones in this post! I LOVE to know if you cook our recipes! 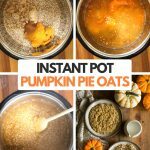 It’s really very easy to cook pumpkin pie steel cut oats in a pressure cooker, so much so that you won’t go back to making it on the stove top again! 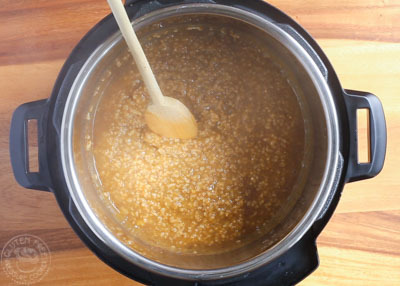 This is a brief step by step guide with photos that shows you how to make steel cut oats in your instant pot or pressure cooker. 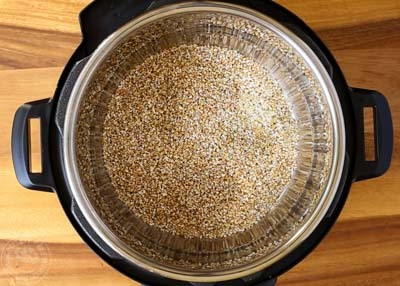 Step 1 – Add one cup of gluten free steel cut oats to your electric pressure cooker, do not use quick cook steel cut oats. 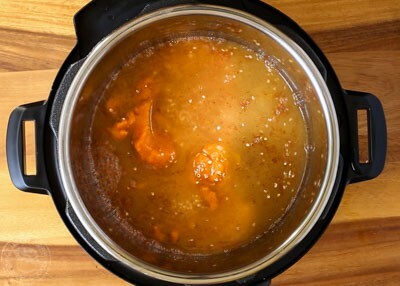 Step 2 – Now add the brown sugar, pumpkin puree, and pumpkin pie spice to the pressure cooker. Make sure your pumpkin pie spice is fresh, I like to buy it new every year as it loses some of it’s lovely flavor if it’s been sitting in your pantry for years. Step 3 – Now add the water and give the mixture a little stir, it will all cook down together once the lid is on so don’t worry if it’s not evenly mixed. 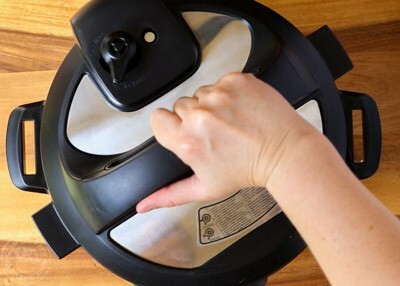 Step 4 – Add the lid and set it to cook for 10 minutes on high pressure, then you need to let the pressure drop on it’s own for 10 minutes after the cook time is up. At that point most of the pressure will be gone, but you still need to carefully release the pressure before you open the lid. Step 5 – When you open it up you will see that just like in the picture below, the water and the oats will be somewhat separated with the water sitting on top of the oats. This is normal and all you need to do is mix it together with a wooden spoon. Step 6 – Now that you have mixed it together you can serve the oats. I deliberately added a small amount of sugar during cooking as I know that tastes vary and I like very little sugar in my oatmeal, whereas, unsurprisingly my kids like a lot more! 🙂 So please taste it and adjust it according to your families tastes. Dark brown sugar, maple syrup and honey all work well as sweeteners with the pumpkin spice flavors. My children loved it with half and half poured over the top to give it some creaminess, if you are dairy free you can substitute with some dairy free milk of choice, or just do without as it’s optional. 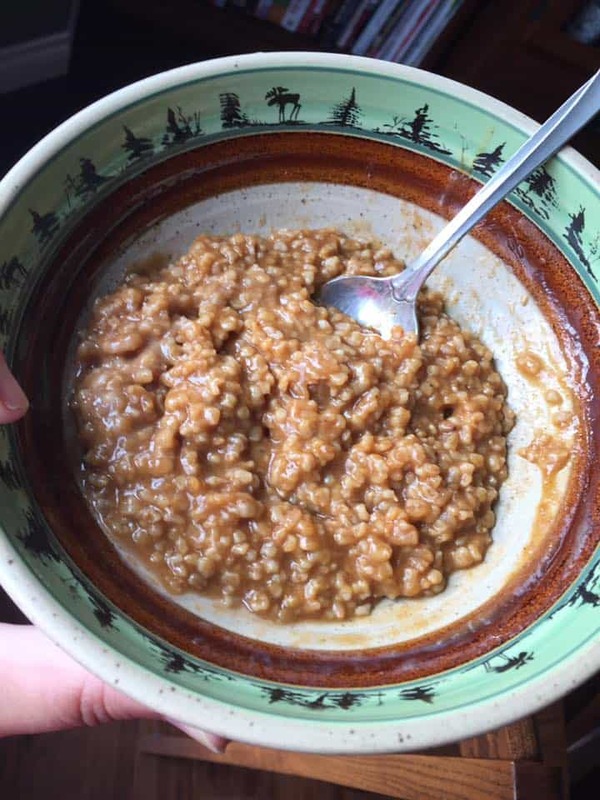 I find it’s best served right away as the longer it sits the more liquid the oats absorb, you can thin them out a little with more water or milk if you prefer. yes, you can double the recipe and the cook time is the same but it may take a little longer to come to pressure because you have more liquid in there. Just be sure that the amount you add does not fill more than half of your pressure cooker, more than that and you may run into safety issues with it being overfull for this type of food which can foam up more than others. How long do cooked steel cut oats keep in the fridge? I’ve kept mine for three to four days without issue, but I can’t say if they would be good longer than that or not. I usually reheat in the microwave and add a very small amount of water to thin it out a little if I need to. 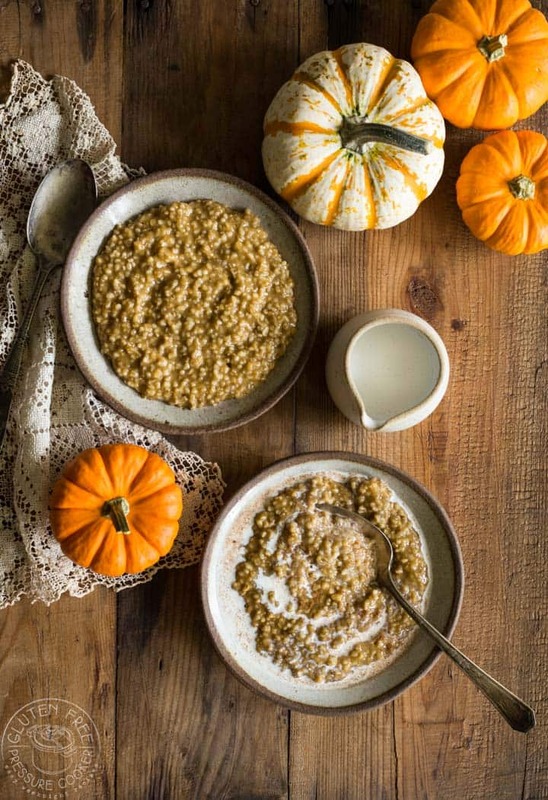 Steel cut oats are oat groats that are cut into a couple of pieces with a steel blade. They take the longest time to cook out of all the oat types, usually about 30 minutes on the stove top, and anywhere from 3 – 15 minutes cook time in an electric pressure cooker depending on how soft you like them. Rolled oats are steamed first to make them soft and then as the name suggests, they are rolled flat. They cook much more quickly than steel cut oats, usually in less than 5 minutes on the stove top. Now I know you’re wondering if you can cook rolled oats in your pressure cooker, well yes you can! 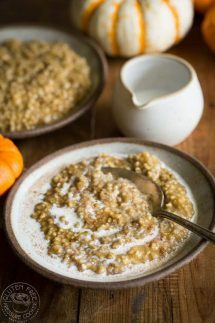 You would need a much quicker cook time as it’s so fast to cook on the stove so you don’t want to overcook it, and it might work best with a little less water than steel cut oats, probably 2-2.5 cups instead of 3. Quick Cook Oats are partially cooked and then rolled out. These oats cook very quickly in just a few minutes and many varieties really only require you to add boiling water and stir, and they are ready to eat. 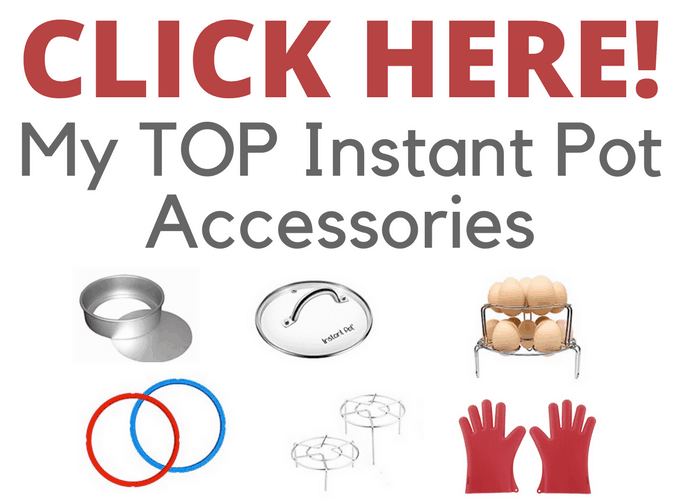 They really are not suitable for pressure cooking so make sure you don’t use them in your Instant Pot. There are many health benefits to oats so I’ll quickly list a few below. One reason I love oats is that they are a naturally gluten free grain which is great, however, if you have Celiac Disease you must be careful to only buy oats that are labelled as gluten free because they can be contaminated with wheat or barley if they are not grown according to the purity protocol to prevent gluten cross contamination. Oats have more dietary fibre than any other grain and contain a specific type of fiber known as beta-glucan which can help to lower cholesterol. According to a Scandinavian study, oats may enhance the nutritional values of the gluten free diets for people with Celiac Disease, particularly for vitamins and minerals, as well as increasing antioxidant levels. Have you ever cooked an Instant Pot Whole Chicken? It’s much, much easier than you think and I even have a cook time chart according to the size of your chicken. And lastly, my Instant Pot Chili is a fabulous recipe that I’ve adapted for the pressure cooker, I think you’ll love it! 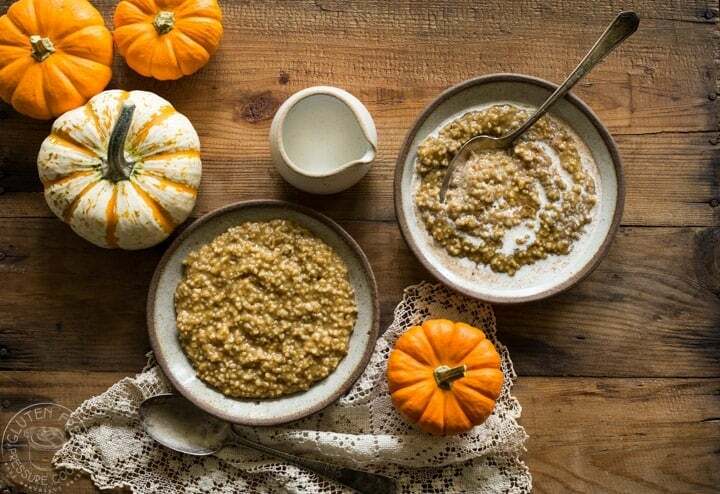 Pressure Cooker Pumpkin Pie Steel Cut Oats recipe for your Instant Pot or Electric Pressure Cooker, it's perfect Fall food and an easy healthy gluten free oatmeal breakfast recipe cooked with brown sugar and pumpkin pie spice! 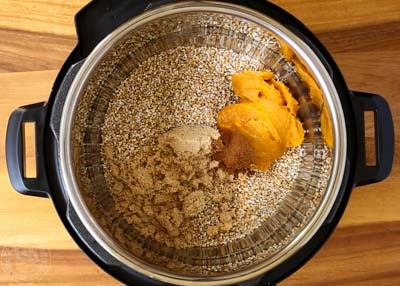 Add the gluten free steel cut oats, pumpkin puree, pumpkin pie spice, salt, brown sugar, and water to your electric pressure cooker and stir well. I added a minimal amount of sugar to the cooked oatmeal so you will need to taste it and add more to your tastes. I served it with half and half for added creaminess, but that's optional. If you have toasted nuts, such as almonds or pecans, they would be a nice additional topping too. Do not use quick cook oats. This recipe is so easy and super delicious!!! This is the first time I’ve made steel cut in the Instant Pot “without” toasting them first and they turned out superb! (I went with 15min Manual, NPR for a soft and smooth texture). The perfect compliment to a fall morning but honestly, I love pumpkin and this new favorite will be a staple year round! Thanks so much for sharing! Yay Becky, I’m thrilled that you liked the recipe and that it worked for you and you loved it, that just made my day! Made this yesterday and it was absolutely delish! I’m in the UK so had to use rolled oats, cooked on high pressure for 4 minutes…yummmmm!! Even my 2 year old enjoyed it! ???????? Oh yay Emma, I’m so glad it worked with rolled oats, thank you so much for letting me know!! I could not find steel cut oats. So I used old fashion oats (not quick cook) with 2&1/2 cups water, cook cooked for 4min and it was delicious! I also added extra brown sugar and pecans after cooking! Thanks for the recipe! Will be making this often! Thanks Renee, Pecans would be a wonderful addition, that’s a great idea!! We made your oatmeal recipe for breakfast this morning. The amount of sugar was just right, and it turned out perfectly. Even the kids enjoyed it. I added just a splash of unsweetened vanilla almond milk to it, but it was delicious all on its own. Will definitely make this one again! Just tried this with Trader Joe’s canned organic butternut squash. It is absolutely delicious! I set the pot to 12 minuets with the 10 minuet NPR. The amount of sweetness was perfect. I’m so happy I found your recipe, it’s one of the best IP recipes I’ve tried. Thanks for sharing it, so easy to follow too! Thank so much Robyn, I’m delighted it worked well for you and that you enjoyed it! I made this oatmeal recipe to take to a brunch today and loved it. I’m borrowing an instant pot from a friend this week to try it out and this was my first time using it. Thanks for the great recipe, just the right amount of sweetness for me! Hi Jen, thanks so much for letting me know it worked and you loved it, I’m so pleased! I hope you will be able to get your own Instant Pot soon, they usually have a fantastic sale on Amazon on Black Friday for IP’s so set your alarm as they usually sell out. Can’t wait to try this oatmeal recipe with apple or peaches. Would also like to try it with walnuts. Ooooh, yes, any of these options would be great ideas Tammy! I just made this now and I absolutely love it and so simple!! I added a tish more sugar afterwards for my insane sweet tooth . 🙂 I saw the nutrition information but was curious how much is an actual serving? Thanks for the recipe! So here’s how you can work out the servings for this recipe (and others that are written in a similar manner) It’s simply the total amount of the ingredients divided by the number of servings listed, so in this case I listed 4 servings so it would be the total amount of cooked oats, sugar, etc and divided up into 4 equal portions, each one is approx. 235 calories per serving, or a total of 940 cals for the whole pot. I don’t know the exact volume amount per serving if that’s what your asking, it’s probably a little over a cup of cooked oats. Would love to try this one out, but I have a question, can I replace the water for almond milk? I prefer to cook my oats with milk instead of water. Thanks! Hi Ivette! So I have read that regular milk can scorch and bubble up in the Instant Pot, however Almond Milk is not really milk so I think perhaps it would be ok to use and not have the same issues. I think the only thing to do is to test it one time and see if it works or not, and I’d love to know if it works for you so please come back and let me know if you have time! This is absolutely amazing! I did cut back the brown sugar to 2 Tbsp and added extra cinnamon (I’m pre-diabetic and need watch added sugar). I cooked this for 9 minutes with NPR and it was perfect! Just wanted to say all oats are gluten free as oats come from a totally different plant than wheat and don’t contain gluten. So to specifically call for gluten free oats is kind of redundant since oats are all gluten free. However this looks amazing and sounds delicious. all oats are a naturally gluten free grain, yes. However this is a gluten free website and I have Celiac disease as does my son so calling for “gluten free oats” is not redundant for me and most of my readers as unless the oats are grown and processed according to the gluten free purity protocol then contamination from wheat that was previously grown in the same fields is the norm, which is why you’ll see some oats specifically labelled gluten free and some not. If I ate oats without the gluten free label I’d be sick for a week unfortunately . Is recipe is great and easy. Going to double it next time. I love this recipe and have made it several times. I do cut back on the sugar and add a bit of Truvia after cooking due to health issues. I’d like to double the recipe, but I’m wondering if you’ve ever tried freezing the finished product. Hi Pam, I have never frozen cooked oatmeal, it might be worth a try though! I do know it will keep for several days in the fridge and still taste great. This is great! I make this all the time, double the recipe, keep the extra in the fridge and warm it up most mornings for breakfast. I do cut down the sugar to 1/4 cup. Thanks for the recipe! I freeze steel cut oats all the time. Just freeze them in muffin tins, and run some hot water over to back to release them once they’re done. Place in a gallon freezer bag. To use, place one or two in a covered bowl in the fridge overnight or simply defrost in the microwave in the morning. They taste great! As does this recipe! Thank you Janice, what a helpful tip!